Humor, wit, and laughter surround each person. From everyday quips to the carefully contrived comedy of literature, newspapers, and television we experience humor in many forms, yet the impetus for our laughter is far from innocuous. Misfortune, stupidity, and moral or cultural defects, however faintly revealed in others and ourselves, seem to make us laugh. Although discomforting, such negative terms as superiority, aggression, hostility, ridicule, or degradation can be applied to instances of humor. According to scholars, Thomas Hobbes's "superiority theory"�that humor arises from mischances, infirmities, and indecencies, where there is no wit at all�applies to most humor. 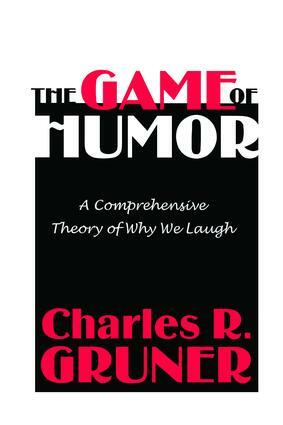 With the exception of good-natured play, Charles R. Gruner claims that humor is rarely as innocent as it first appears.Gruner's proposed superiority theory of humor is all-encompassing. In The Game of Humor, he expands the scope of Hobbes's theory to include and explore the contest aspect of "good-natured" play. As such, the author believes all instances of humor can be examined as games, in terms of competition and keeping score�winners and losers. Gruner draws on a broad spectrum of thought-provoking examples. Holocaust jokes, sexual humor, the racialist dialogue of such comic characters as Stepin Fetchit and Archie Bunker, simple puns, and many of the author's own encounters with everyday humor. Gruner challenges the reader to offer a single example of humor that cannot be "de-humorized" by its agonistic nature.The Game of Humor makes intriguing and enjoyable reading for people interested in humor and the aspects of human motivation. This book will also be valuable to professionals in communication and information studies, sociologists, literary critics and linguists, and psychologists concerned with the conflicts and tensions of everyday life. The Special Case of Puns: Wordplay is a Game to be Won, Too.